New Snowgoons Album - Snowgoons Infantry. The Major Bundle contains of 1 x USB Grenade (Mp3 Album) , 1 x Snowgoons Infantry Dog Tag (Including Chain), 1 x Snowflake Ski Mask & Stickers. 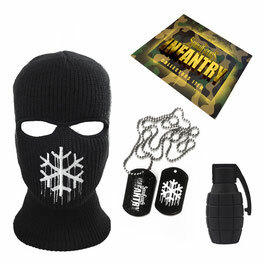 The Bundle will be shipped in a special Infantry Bag personal numbered by the Snowgoons.